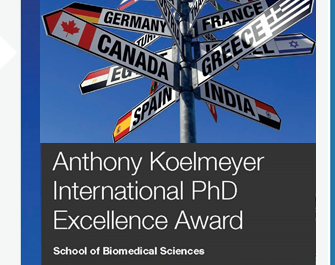 The Anthony Koelmeyer International PhD Excellence Award offers graduate research students a contribution of $2000 towards international travel for conferences and research training in overseas laboratories in order to enhance their PhD experience. Also please see the story about past awardees in Monash Memo and the School of Biomedical Sciences website. Yu Bo Yang Sun - Department of Anatomy and Developmental Biology, for travel to the USA and UK. Sophea Heng - Department of Biochemistry and Molecular Biology, for travel to the USA and Puerto Rico. Amy Winship - Department of Anatomy and Developmental Biology, to present her work at the International Federation of Placental Associations in France. Also to a present her work at the Society for Reproduction & Fertility and World Congress Reproductive Biology in Scotland and visit labs at the University of Manchester in the UK. David Cameron - Department of Microbiology, to present his work at the International Symposium on Staphylococci and Staphylococcal Infections (ISSSI) and to visit a lab at the University of California, San Diego in the USA. Leon Teo - ARMI, to present his work at Neuroscience 2014 in the USA. Phong Nguyen - ARMI, to present his work at the International Society for Stem Cell Research 12th Annual Meeting in Canada and the 11th International Conference on Zebrafish Development and Genetics in the USA. He will also visit labs in the Canada and the USA. Christopher Chan - Department of Pharmacology, to present his work at The First Meeting of the Australian & European Consortium on Immune Mechanisms in Vascular Disease & Stroke in Italy and visit labs at the Jagiellonian University School of Medicine, Krakow, Poland. Sandy Lee - Department of Pharmacology, to present her work at The First Meeting of the Australian & European Consortium on Immune Mechanisms in Vascular Disease & Stroke in Italy and visit labs at University Hospital Hamburg Eppdorf, Germany, Vanderbilt University, USA and National University of Singapore, Singapore. Dr Victor Puelles - Department of Anatomy and Developmental Biology, to present his work at the International Society of Nephrology Forefronts Symposiums: Stem Cells and Kidney Regeneration in Italy and visit labs at the University of Heidelberg and University of Aachen, Germany. Jessica Morison, Monash Immunology and Stem Cell Laboratories, to present her work at the Society for the Study or Reproduction and to visit labs at Columbia and Rockerfeller Universities in the USA. Andrew Major, Department of Anatomy and Developmental Biology, to present his work at the American Society of Andrology and visit the Jackson Laboratories, Washington State University and the University of Nevada in the USA. Jenna Haverfield, Department of Anatomy and Developmental Biology, to present her work to the European Congress of Immunology and visit Oxford University in the UK and Harvard and Columbia Universities in the USA. Andrew Clarke, Department of Biochemistry and Molecular Biology, to present his work at an immunology conference in Greece, and to visit labs in England, Scotland and Wales. Sarah Hass Lockie, Department of Physiology, to present her work at the Society for Ingestive Behaviour meeting in Florida, and to visit labs in Michigan and Ohio. Jeffery Moore, Department of Pharmacology, to present his work at the American Heart Association’s High Blood Pressure Research Scientific Sessions in Florida, and to visit colleagues at Emory University, Atlanta.